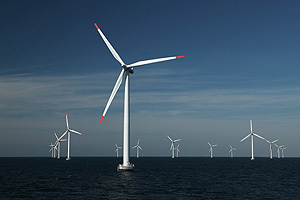 The Nysted Offshore Wind Farm is among the renewable energy facilities operating in the Danish community of Lolland. Image courtesy of Nysted. Faculty at the University of California, Santa Cruz, have organized a renewable energy program that will bring together U.S. and Danish students for four weeks this summer in Lolland, Denmark. The Lolland California Renewable Energies (LoCal-RE) program is an international collaboration involving three UC campuses--Santa Cruz, Davis, and Merced--and Denmark's Roskilde University and Technical University of Denmark. About 20 UC students and 20 Danish students, both undergraduates and graduates, will take part this summer. The students will visit communities in Lolland, where a variety of renewable energy sources are being used, and they will work with experts to study these projects. Such hands-on, project-based learning will give them a better grasp of the complexities involved in the global push to shift from fossil fuels to sustainable and renewable forms of energy, said program organizer Ali Shakouri, a professor of electrical engineering in UCSC's Baskin School of Engineering. "We teach theoretical concepts of renewable energy devices and sources in our classes at UCSC," Shakouri said. "But our best demonstrations involve, for example, only small solar cells that students can purchase from RadioShack. So they understand the fundamentals, but they don't get a feeling for renewable energy's real-scale implementation." Concerns over the impacts of fossil fuel consumption on climate and the environment are driving current interest in renewable energy sources. Lolland, a municipality south of Copenhagen, is at the forefront of developing and implementing renewable energy and has signed a "green partnership resolution" with the City of Santa Cruz. Lolland Mayor Stig Vestergaard came to UCSC last year as part of a delegation visiting the Santa Cruz area. Lolland's projects include large-scale facilities such as the Nysted Offshore Wind Farm (the world's largest), the Vestas Wind Systems blade factory, as well as "community test beds" for renewable energy sources that don't yet exist commercially. For instance, researchers at the Hydrogen Community on Lolland recently completed a project using wind power to generate hydrogen gas and pump it through pipes into several houses. They then used another device to convert hydrogen in these houses to electricity and heat. "This is not the type of project where you can do a one-time demonstration and show that it works, that the problem is solved," said Shakouri. "It's still too expensive, and the flammability of hydrogen is a concern. At Lolland, we'll be able to study the data they collect over the years and see how these problems might eventually be solved." Bioenergy plants are also a big feature in Lolland. Corn and other energy crops are distilled to produce alcohol, which can then be added to conventional gas to make "gasohol." Adding vegetable oils, such as soybean oil, to regular diesel (a byproduct of petroleum) produces biodiesel. Methane from animal waste, such as cow manure, can also be used as a fuel. "It's about burning organic products like plants, instead of fossil fuels," Shakouri explained. "You'll still generate carbon dioxide, but when that plant was growing, it absorbed the same amount of carbon; so burning it doesn't cause a net change in the atmosphere." As with hydrogen, however, bioenergy has its own problems, chief among them the impact on world food supplies of using crops for fuel. Even wind energy has its problems; some wind farms kill significant numbers of birds such as eagles and hawks, which collide with the blades of wind turbines. "The overriding principle here is that there's no free lunch," said Shakouri. "So we emphasize the drawbacks, as well as the strengths, of each renewable energy technology." Shakouri will be joining the students in Denmark this summer as one of five members of the program's teaching staff. The others include Joel Kubby, associate professor of electrical engineering at UCSC, Bryan Jenkins, professor of biological and agricultural engineering at UC Davis, and two faculty members from the participating Danish universities. Shakouri studies thermoelectric devices based on metals and semiconductors that directly convert heat into electricity; he's working to find new materials that will increase their efficiency. These materials are called "nanocomposites," as they involve the mixing and manipulation of matter at the atomic scale through nanotechnology. Shakouri heads the Thermionic Energy Conversion Center, which includes 12 research groups from seven U.S. universities, all focused on the goal of making new metal-semiconductor nanocomposites. Eight of the U.S. students participating in LoCal-RE this summer hail from UCSC. They all did well in Shakouri's "Renewable Energy Sources" course and were selected on the strength of their application essays. Daniel O'Leary, a graduate student in computer engineering, said he looks forward to meeting European researchers in the field of renewable energies. He will also be looking for ideas for a renewable energy lab class he is developing with Shakouri and Kubby at UCSC. Lara Hale, an undergraduate majoring in environmental studies and biology, applied for the program in order to visit Lolland's renewable energy sites and interact with a local community that has become energy independent. The best way to learn about renewable energy's potential applications, she wrote, is "to see them with my own eyes." "The one thing I want to leave Denmark with is optimism--the belief that we can do it, too, and that sustainability is more than a pipedream; it's a reality at our fingertips if we just reach out and grab it," Hale said. The other six UCSC students are Toshimi Barks, an undergraduate majoring in environmental studies; Tela Favaloro, a graduate student in electrical engineering; Mona Hammoudeh, an undergraduate majoring in environmental studies with economics; Jeremy Hieb, a graduate student in electrical engineering; Philip Jackson, an undergraduate majoring in physics; and Juan Pasqua, an undergraduate majoring in civil engineering. At the end of the summer program, each student will write one chapter of a final research report covering analyses of renewable energy problems, solutions from Lolland that might be useful in their home communities, and recommendations for the future. Shakouri and the other participating faculty members are also discussing the potential for graduate-level exchange programs between universities in Denmark and California, along with internship opportunities at various renewable energy companies. Next year, LoCal-RE will be held on U.S. soil; students will spend two weeks at UCSC and another two at the NASA Ames Research Center in Silicon Valley. According to Shakouri, California is of great interest to Danish researchers as a state with some of the most progressive laws for increasing the use of renewable energy and for encouraging sustainable development. The state is also home to many innovative start-up companies in green technologies, he said. "Scientists should be aware of the social aspects of implementing new technology," Shakouri stressed. "I think if we focus only on making better solar cells, better engines.that alone won't solve the energy problem. People will have to change their way of life, which isn't easy." Note to reporters: You may contact Shakouri at (831) 459-3821 or ali@soe.ucsc.edu.